Writers in the Storm welcomes back James R. Preston with tips on how–and when–to add humor to your WIP, no matter the genre. Here he is with a fun-filled Laugh? I Thought I’d Die WriterStrong post. There’s this PI investigating a murder at a nudist camp in the hills above LA . . .
See the possibilities? Maybe you do and maybe you don’t. Stay tuned. Post an Excerpt, Any Excerpt. Ok, back to normal for a month. This is your chance to shine, so post any excerpt of no more than 500 words, and, if you have them, your buy links. Don’t have buy links, post your website, blog, Twitter and Facebook info. Here is mine from my debut novel, The Seduction of Lady Phoebe. Marcus arrived at Cranbourne Place late on the day of the fight. As he jumped down from his curricle, Amabel, his sister, appeared at the door, clearly delighted to see him. She was as fair as he was dark. She wore a gauzy white day gown that seemed to float around her as she gracefully descended the stairs of the portico and held out her hands in greeting. They’d exchanged letters and portraits over the years, but the last time he’d seen her she’d still been in the schoolroom and wore braids down her back. She tucked her arm in his and led him into the house. A large man stood in the entrance. Geoffrey, Earl of Cranbourne, his brother-in-law, was easily as tall as Marcus, in his mid-thirties, and dressed for the country in buckskin breeches, and a loose shirt, waistcoat and hunting jacket. This has been a really busy month. I’m not participating in Eight Sentence Sunday, but will return next Sunday. Today I’m on Happily Ever After Thoughts, http://www.happilyeverafterthoughts.com/, the last stop on my mini-blog tour celebrating the pre-order release of my debut novel, The Seduction of Lady Phoebe. Please stop by to read a new excerpt and the last chance to win a copy of TheSeduction of Lady Phoebe. News, News, and More News!!! And last, but not least, I was featured on the blog, First Kiss Friday!! 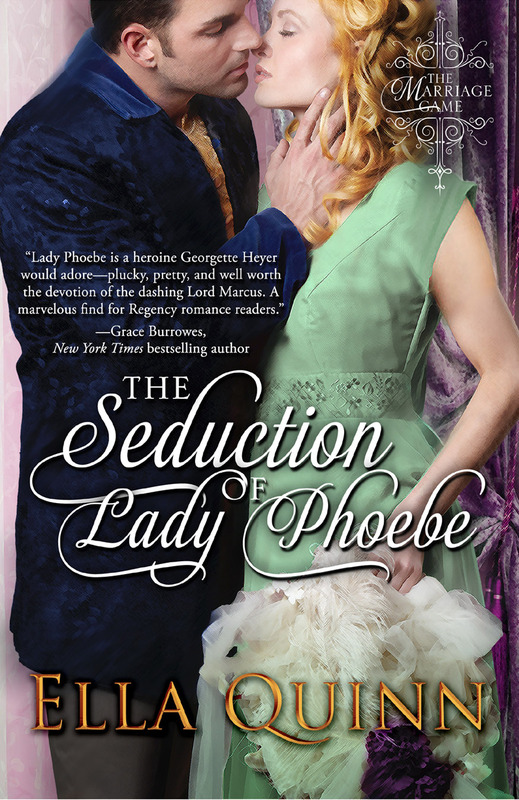 http://www.laurel-odonnell.com/ Where Lady Phoebe and Lord Marcus share their first kiss, and I’m giving away another copy of The Seduction of Lady Phoebe. I can’t wait to here what you think of all of this. My guest today is multi-published, award-winning, Regency author Bronwen Evans. Bronwen lives in New Zeeland, and will stop by when she wakes up to answer any of your questions. We’d planned to have a regular interview, but were defeated by technology and time zones, so please do ask questions. Bronwen will also give away a copy of her latest book to one lucky commenter who leaves their email address. Bronwen has had lots of news lately. Her novel Invitation to Scandal has been nominated by The Romance Review Book of the Year Best Historical. She has just signed a contract with Random House’s Loveswept line for a new series called The Disgraced Lords. Her first book in that series, sorry no cover yet, is A Kiss of Lies which will release in January 2014. And the best news, Bronwen has a new book, Invitation to Passion releasing in May. Consummate rake, Richard Craven, has his heartbroken when the woman he loves is forced into an arranged marriage to a violent brute. To make matters worse, circumstances force him to marry Madeline Knight—a woman he views more like a sister-only for fate to play the cruellest of tricks. Shortly after his wedding his former lover is widowed, and Richard learns she could be pregnant with his child. While Richard and Madeline confront the reality of their marriage, Madeline’s life comes under threat. A family enemy is set on revenge. Will Richard learn the truth of his heart, and what is truly precious to him, before the unknown enemy destroys their world? To tempt you even further, I’ve added an excerpt. Richard James Craven was a dead man. That’s if Charles Hawthorne, the Marquis of Wrentham, found him. Maddy watched the Marquis as he stood at the top of the stairs, surveying the guests in the crowded ballroom below. His presence here at Hascombe Court meant only one thing. He’d come for his wife. A curse on Richard’s head. Just last week Maddy had begged him to end his affair with the Marquis’s wife. Now she would have to get involved. She hated getting involved. Richard had looked after her welfare for years and she felt obligated to return the favour. Madeline Knight you are such a liar. She wanted to return the favour. Maddy blew a curl out of her eyes, and peered through the plants sheltering her from the eyes of the ton. She’d been hiding most of the evening. Rufus had organised this ball for her. She loved her brother, but he’d recently married his one true love, Rheda, and was determined to help his younger sister find the same happiness. Unfortunately, Madeline’s idea of a suitable husband differed vastly from his. She did not wish to marry into the echelons of Society. Due to her father’s rumoured treason, she’d grown up in seclusion, here at their country estate near Newmarket. Even though she was the sister of a wealthy Viscount, correction, now Earl, due to the scandal surrounding the Strathmores, she had expected to marry beneath her social standing. A local squire or vicar. She felt perfectly capable of settling into the quiet country life. The strictures and sophistication of the ton frightened her to death. Besides, at nineteen, she had plenty of time to choose a husband. Now that her brother resided permanently at home, she did not wish to leave his household any time soon. With growing unease, Maddy watched Lord Wrentham scan the ballroom, then begin to make his way across the crowded floor. Luckily the room was packed. With Rufus succeeding in clearing their late father of treason, and her brother having a second title bestowed on him, Earl of Hascombe, the ton’s interest had been caught. Tonight it seemed all London Society were in attendance. Her eyes followed the Marquis’s path through the guests. Lord Wrentham was definitely looking for someone, and she was sure it was his beautiful wife, Sara. It was up to Maddy to warn the lovers. She straightened her shoulders and stepped out into the crush. The music drowned out her determined stride. She circled round until she was able to locate her brother. “Lord Wrentham has arrived. You should go and greet him. Now would be the perfect opportunity to put the past behind you. He carries at lot of influence in the House of Lords. Lord Wrentham would be a valuable ally.” Not really a lie. Rufus had taken a special interest in the rights of workers, his wife’s influence, and he was chasing the Marquis’s vote on labor law reform. All the while her brother talked, Maddy guided him ever closer to Wrentham. “Your wife is, as always, a gem. What is this rush to get me to the altar? I’ve only just got you back in my life. Now you are married, don’t you want me here?” She couldn’t disguise the hurt in her voice. Her brother’s determination to see her quickly wed made her feel as if she was a nuisance, or in his way. She abruptly turned and schooled herself to walk away slowly, and in the opposite direction to the library, where she assumed Richard had taken Sara. Richard knew every square inch of this house intimately. Over the years he’d spent many nights under this roof. Many nights teasing her. Teaching her. Talking to her. Blast it all. She’d have to go and warn Richard. Richard was her only true friend, she didn’t wish to see him killed in a duel, or sent fleeing from England for having killed Lord Wrentham. Once out of sight of the guests, she lifted the hem of her dress and rushed toward the library. Skidding to a halt outside the door, her courage momentarily fled. What would she observe when she opened this door? Was she prepared to see her Richard in the arms of another? Her Richard! She acknowledged her claim was a monumental fantasy. Richard was her friend. That was all. He still saw her as the thirteen year old girl he’d rescued from the Hawthorne bullies. Just a friend, she silently scolded herself. Yet Maddy didn’t understand the riotous feelings she’d developed over the last twelve months. Whenever she looked at Richard, her heart beat harder, her stomach knotted, and her body warmed in certain places she was embarrassed to discuss. A stab of jealousy hit her chest. Madeline secretly hoped Richard was doing nothing more than talking with Lady Wrentham. She knew Richard and his rakish ways, and realised that was unlikely. But a girl could dream. She dreamed of Richard a lot lately. Bronwen loves story-telling – gobbling up movies, reading books and attending the theatre. Her head is always filled with characters and stories, particularly lovers in angst. Is it any wonder she’s a proud romance writer. Bronwen attended Victoria University, Wellington, New Zealand earning a bachelor’s degree in Commerce and Administration, majoring in Marketing and Accounting. She was all set on building herself a business career (which she did along the way). But life never turns out exactly as one thinks. After working for a few years in marketing roles within New Zealand financial institutions, she left for a 6 month overseas experience in London, England. She loved England. She spent several years living in London, using it as a base to be able to work and travel from. She visited all four corners of the globe. Her most interesting trips were a camel safari in the Sahara, a trip through Russia, a safari through Africa with her mother, and three months in the Mediterranean. It was while living and working in London she discovered the offices of Mills & Boon and the germ of an idea to embark on a romance writing career was born. Almost eight years later, on her return to New Zealand, encouraged by a close friend battling a life threatening illness, Bronwen finally started down the path to publication by joining RWA, The Beau Monde, RWAustralia and RWNZ.